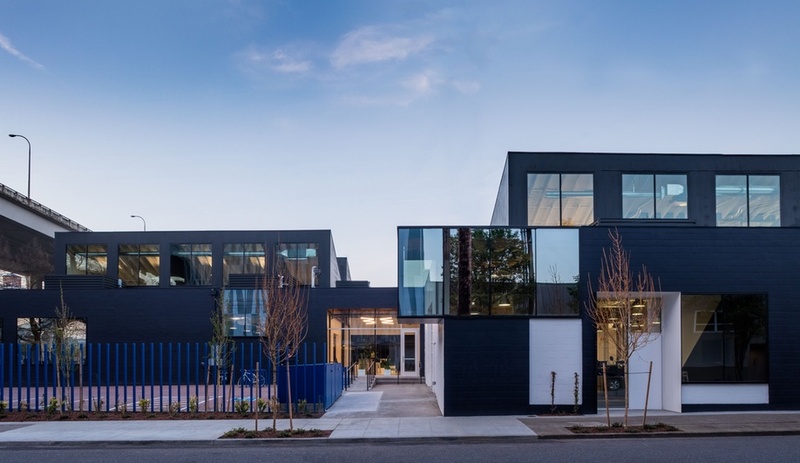 Beebe Skidmore architects has transformed a former industrial space into a graphic, minimalist headquarters for Swift, a fast-growing agency in Portland. 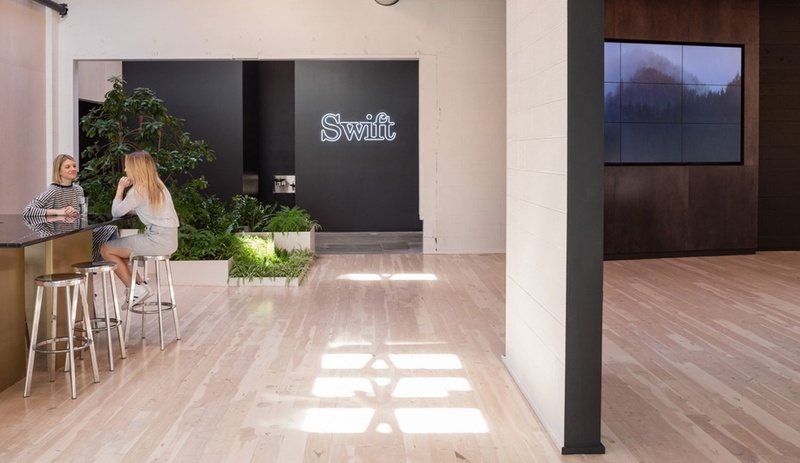 The exterior of Swift’s new headquarters, in Portland’s gentrifying Slabtown neighbourhood, betrays few signs of its history. Formerly an awning warehouse and a light manufacturing factory, the original site was comprised of five individual buildings, built one at a time between 1959 and 1974. 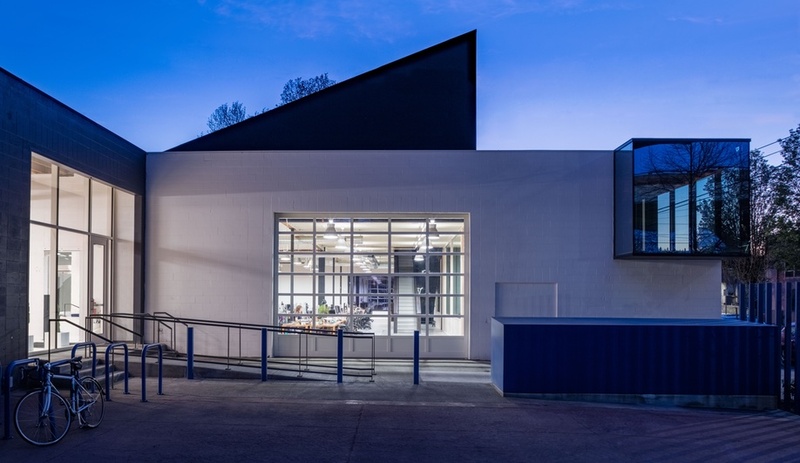 Transformed by local real estate developer project^ and designed by Beebe Skidmore, the adapted building now appears purpose-built for 2017, with cantilevered volumes and a graphic navy-blue-and-white paint job. 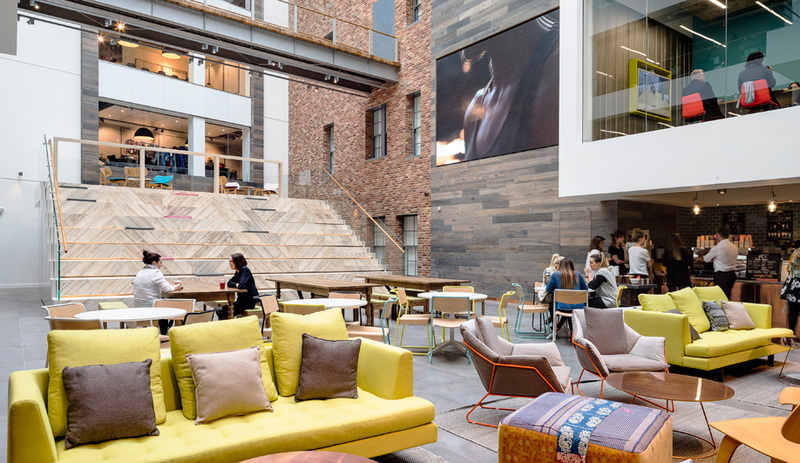 The firm was first hired to convert the building into five leasable office spaces, connected by a common lobby. 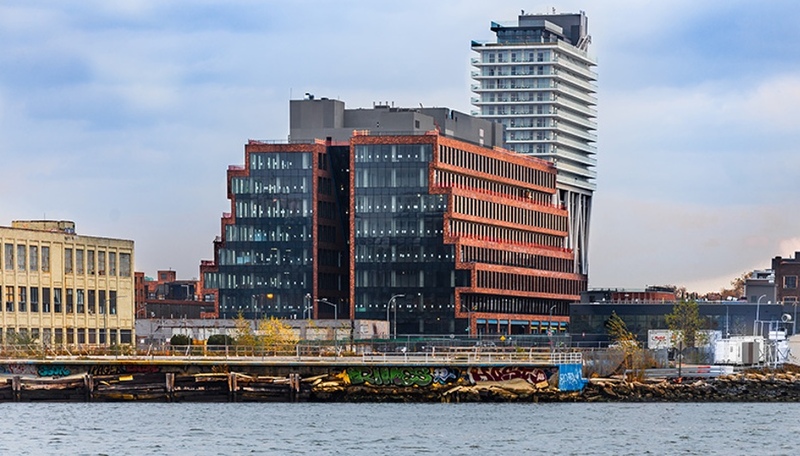 They preserved the structure’s original shell and added four double-height roof monitors, drawing light into the building’s core and creating a bold sawtooth roofline. 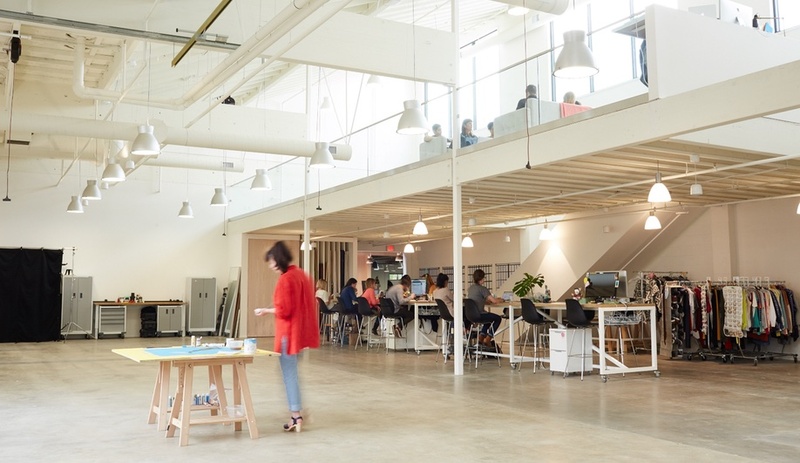 When Swift, a creative agency looking for a bigger workspace, saw the plans, they leased all five spaces and hired Beebe Skidmore as the architects for the interior. 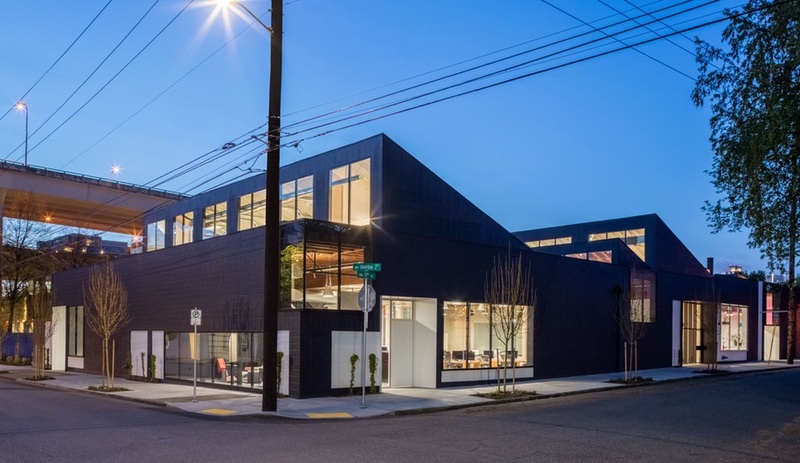 The company moved into the space in spring 2016 and in November, the project won top honour awards in building design from two chapters of the American Institute of Architects. 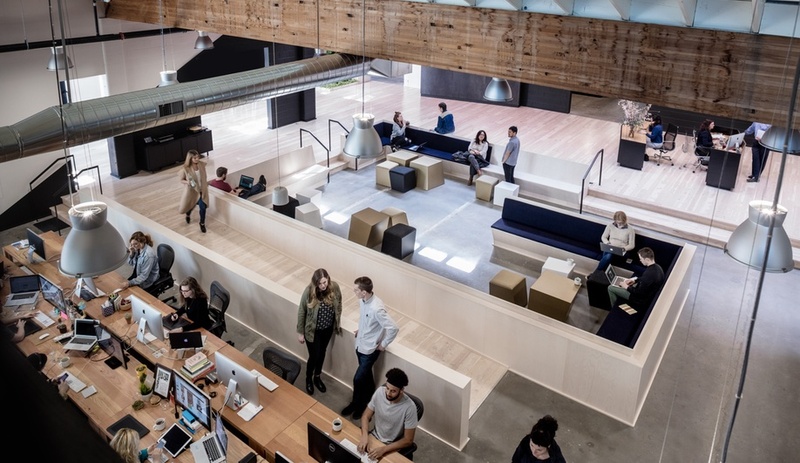 Inside, the 2,787-square-metre space is decidedly modern and minimalist. It’s been devised as four quadrants linked by “streets” that run north-south and east-west. These roads lead to the “Colony,” a hub with seating for casual meetings and large gatherings. 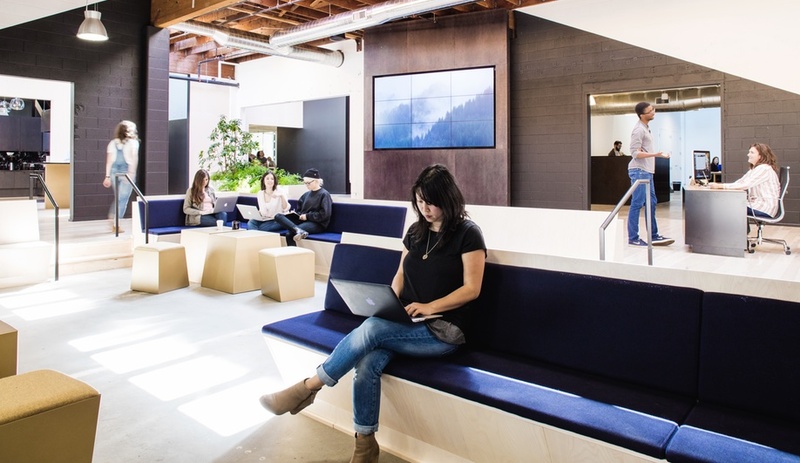 Similar gathering spaces can be found throughout Swift, which, as is the modern way, has no individual offices; instead, staff sit at shared work tables. 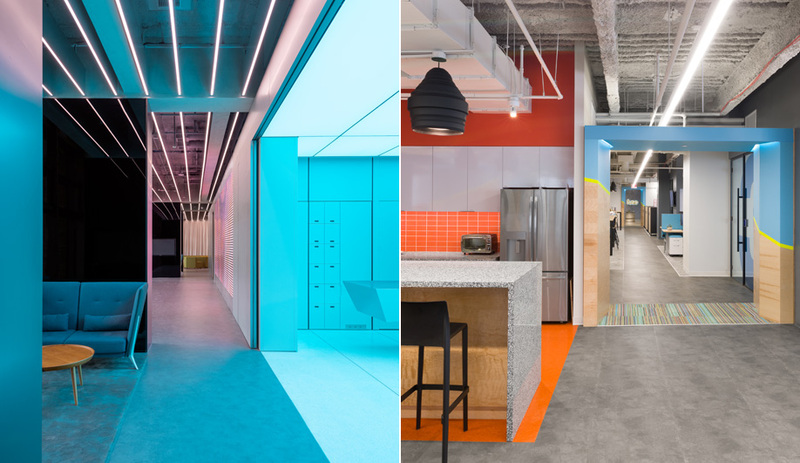 The space contains three conference rooms, five small meeting rooms, seven collaborative lounge areas, three kitchens, and seven “nest” rooms dedicated to specific agency accounts, where teams can leave their work pinned to the wall. 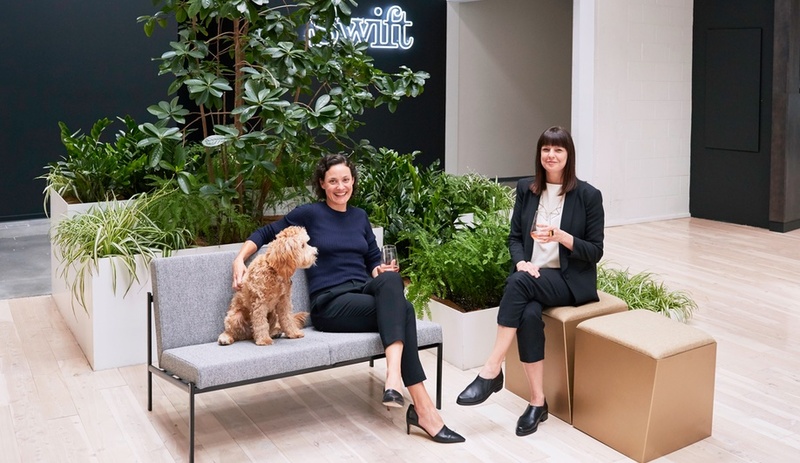 “Swift’s program required that nearly 50 per cent of the open area be amenity spaces and enclosed meeting rooms,” explain Heidi Beebe and Doug Skidmore, the architects who headed up the project. 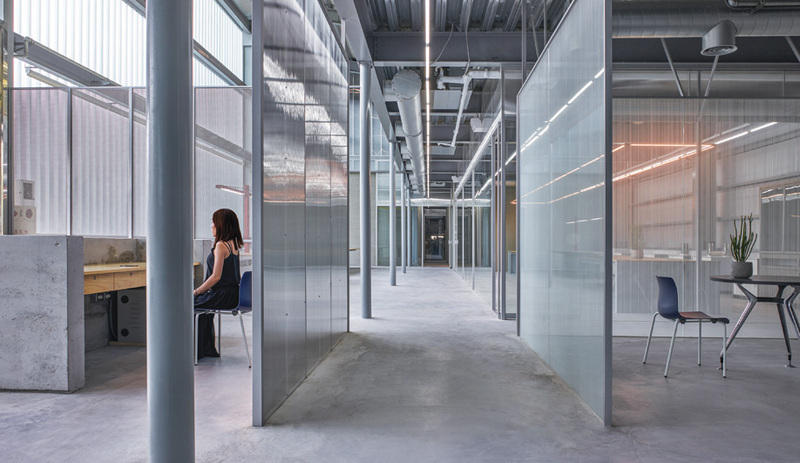 “The primary design challenge of this project was how to create a lot of enclosure without losing the open industrial feel.” To maintain the openness, and create connections between the various spaces, the firm enclosed each of the meeting rooms in frameless glass, allowing employees to look out from the centre of the building, through the workspaces and into the street. 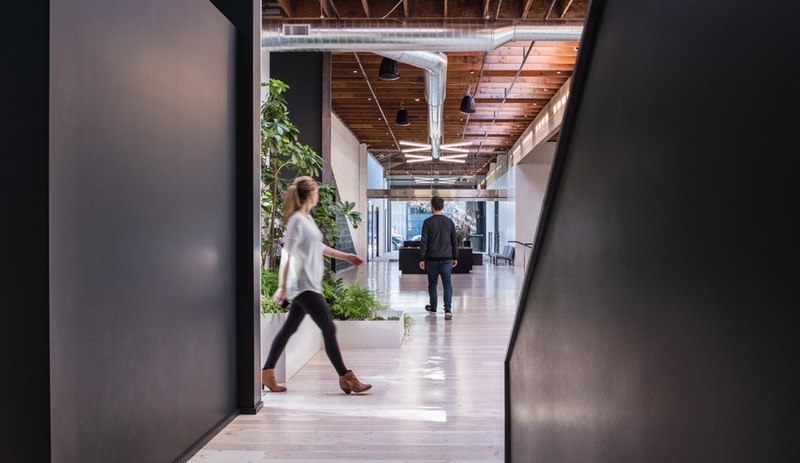 “The many different types of work areas combined with transparency and open sightlines to all corners and quadrants of the building, make the workplace feel alive, active and energetic. You can literally see Swift at work,” say Beebe and Skidmore. 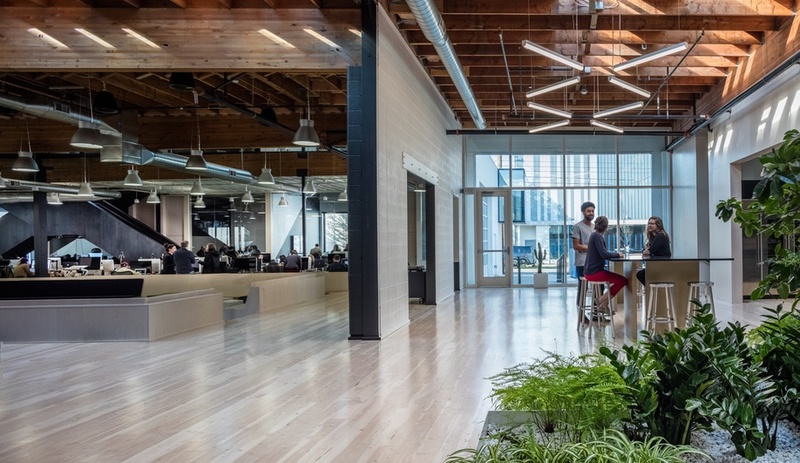 Swift wanted to incorporate “a collage of industrial elements and refined design details and materials.” To highlight the strengths of the original building, Beebe Skidmore left the exposed ceiling beams untreated, cut in new skylights and, in the office’s photo studio, painted the ceiling white. Existing garage doors were upgraded with new glass doors and interior and exterior concrete block walls were also painted. 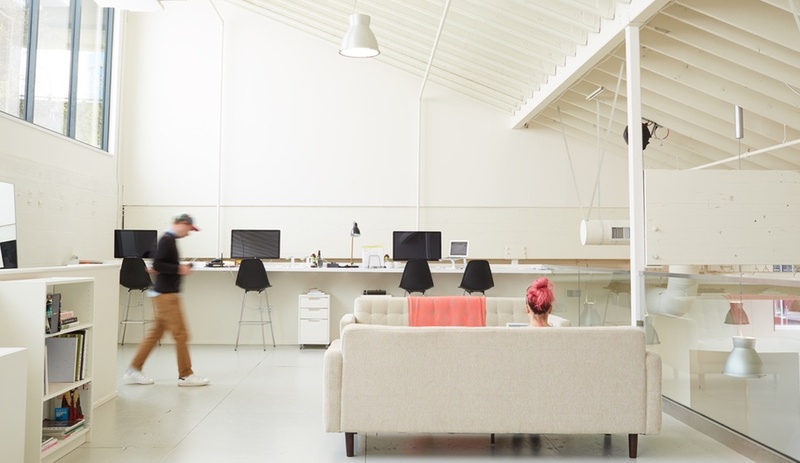 The office is largely unadorned, but graphic moves, a calming palette and a few custom design pieces create a hip atmosphere that suits the creative work that happens within. Black, white and cobalt are the dominating hues, found on walls and furniture, with accents appearing in metallic, coral and blush. Raw concrete flooring is complemented by whitewashed juniper planks in other areas. Swift collaborated with The Good Mod, a local vintage showroom and design-build workshop, to create custom statement pieces. 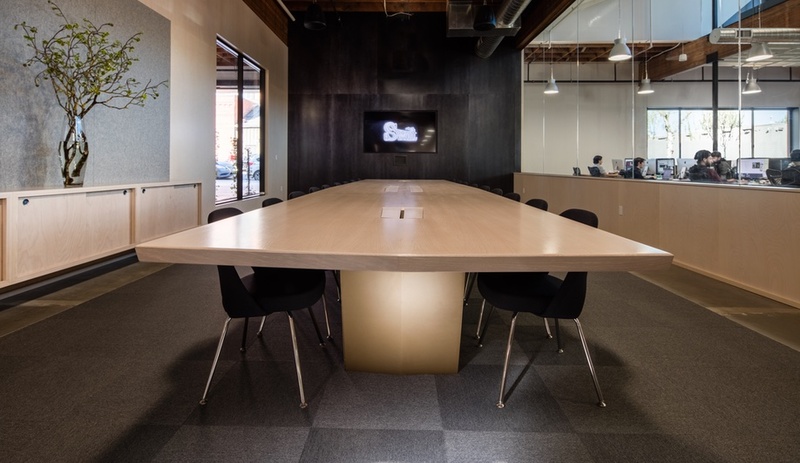 In the conference room, an extra-long rift-sawn white oak table conceals technology and outside, in the courtyard, a sculptural zig-zagging steel base supports a black resin picnic table for outdoor lunches and meetings. The company was founded by women and it was important to the team that the fact be represented in the design. 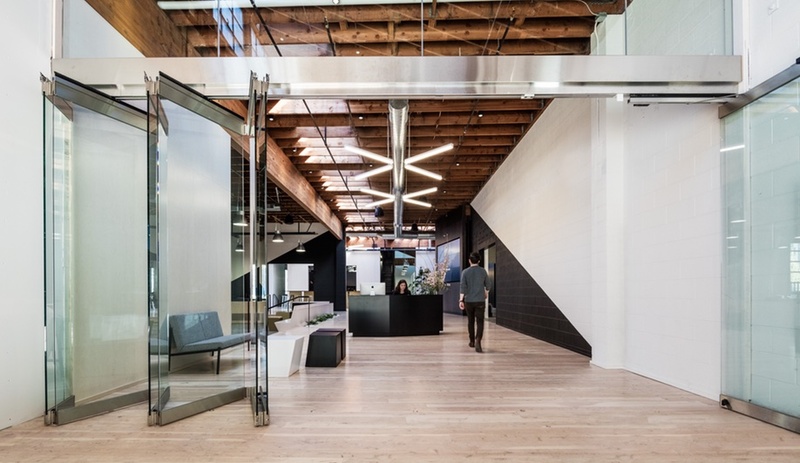 A bold criss-crossed birch staircase, stained a glossy black, and light fixtures of LED tubes by Cree, crossed in an X formation, were incorporated as a nod to the X chromosome.